The culture of the Norse is full of wonderful lore, and it is through this lore, the ancient poems and tales, that we have gained a better understanding of the beliefs of our ancestors. For some, these old stories are sacrosanct; they form all that is needed for working and growing with the residents of Asgard. Many of us look at the old tales more as a starting point, a basis from which to develop and tell new tales. 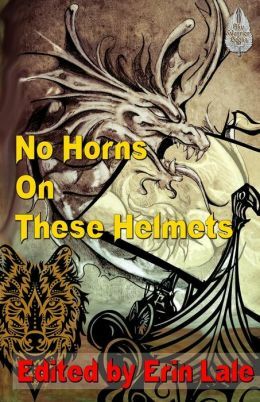 No Horns on These Helmets, edited by Erin Lale, falls into this latter category. The book provides a wonderful mix of twenty stories, tied together only with the common theme of having some connection to the mythology of the Norse. A number of the tales are set in modern times, others take place in a time more suited to kings and Vikings, and some even project the relevance of ancient gods into a futuristic society. Colorful characters abound, running the gamut from gods and heroes to giants and monsters. The gods of the Norse wander throughout these tales, sometimes hidden behind the scenes, other times more obvious. One goddess about whom little is known from the Eddic lore is Sigyn, the ever-faithful spouse who strives to comfort her imprisoned husband Loki. Here, several authors have taken the small intact pieces of her lore and expanded the story, from her bittersweet maternal role in Brianne Chalfant’s “Second Time Around” to a more technical one in the futuristic “In Chains Until Ragnarok,” by Tyree Kimber. The old tales are further enhanced in Gerri Leen’s “To Love Loki” and, in the tale which takes its name directly from her and suggests an alternate view of her husband’s well-known exploits, “Victorious Girlfriend” by Laura Dasnoit. Among the folktales, Erin Lale’s “Woodencloak” provides a retelling of a Norwegian fairy tale, but with some wonderful added twists that turn it into a fresh story without losing the classic elements of the original. It’s a tale in which some elements may feel reminiscent of such better-known tales as Cinderella, but this tale, especially in this telling, is unique. Another arcane folktale retold here is from the Deitsch, “The Legend of Delbel the Butzemann” by Robert Lusch Schreiwer. While “Woodencloak” has medieval castles and forests, “Delbel” is strictly agrarian, the tale of an animated scarecrow and the mischievous spirit who takes control of him. For fans of fantasy and horror, there is plenty here to provide hours of reading entertainment. Hugh B. Long’s “A Draugr’s Tale” serves as an excellent reminder that, a thousand years before the likes of The Walking Dead or George Romero, the Norse had tales of undead monsters that could make the sturdiest Viking shiver in his sleep. A horrifying sea monster rises from the depths and attacks in Christine Morgan’s “Blades of Ice and Ivory,” while L. J. Bonham’s “Blood Allies” ties together the modern motif of werewolves vs. vampires to a distinctly northern environment. What might be the most frightening tale of all, “Jörmungandr,” by Jeff Szappan, is a tale of a devastating, unstoppable monster too small to even see, yet nonetheless hinted at in the lore. In all, I found No Horns on These Helmets to be a fascinating read. While quite diverse in their characters and plots, most of these tales quickly hooked me. As a student of Old Norse lore and a lover of a good story well told, I found much here that pulled my imagination into worlds that were at once familiar and strange.